in the Fall of 2013. Laura M. Hair’s work is centrically nature based, following the developmental path of congruous structural designs in organic configurations, with specific consideration directed at the visual connection to the human form. 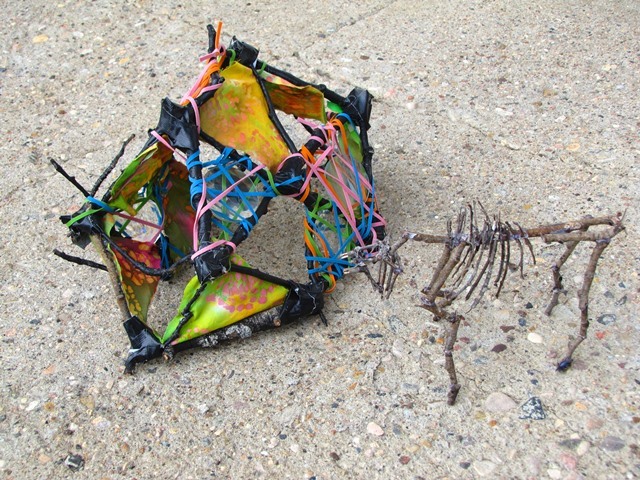 The morphogenesis of shapes is realized in her mixed-media installations. Georgian College School of Design and Visual Arts, Barrie. 2013 saw the inclusion of her art in a book promoting the Clarington region. exhibits include Watershed, a solo show at Georgian College and Filmic, an IRIS Group show at the Station Gallery, Whitby. of Durham Region artists, curators, instructors and writers. Judith Mason is a practicing artist and art educator. She holds a BA in Cultural Studies; a BA in Education and is currently completing an MA in Art Theory. In conjunction with her academic work Mason has spent many years teaching art workshops using numerous approaches. Additionally she has studied textiles, ceramics, drawing and printmaking, sculpture, photography and has been involved in curatorial practice. Much, if not most, of her work over the past three decades has been completed in and around Peterborough and in the Clarington area, not far from the Robert McLaughlin Gallery, known for its outstanding collection of Painters Eleven. Like Painters Eleven, Mason’s work is characterized by tensions between formal abstract minimalism and recognizable topographies. Her paintings draw parallels between structural abstraction and more conventional visualizations that might be likened to architectural blueprints or biological diagrams that illustrate cell division. Mason's work is rich and eclectic, reflecting both the influences of other contemporary artists and the panoramic scope of her multi-media exploratory history. Holly McClellan’s photography offers a suburban viewpoint and is rooted in the familiar and everyday. Inspiration comes from sources such as consumerism, industry and their relationship to the environment. Time and space are addressed by pushing technical boundaries with the medium, using either analog or digital techniques. References to visual art, especially abstract painting and the medium of photography itself, play an important role during the shooting stages. She received her fine art degree from York University and her applied photography diploma from Sheridan College. Recent exhibition activity includes participating in Percolate, a group exhibition for Toronto’s 2010 CONTACT photo festival, with Nicholas Tinkl and Tricia Dunk Tinkl. In 2009 a number of public events were done for the Garbage Dress Series. Members of the public are asked to bring in their unwanted clothing. A sculptural dress is created against a custom fabricated metal frame, using the unwanted clothing. Each dress and photo shoot are site specific. Disposal of the clothing is also part of the process. Through this series and another related body of work, Holly McClellan’s artistic practice is starting to expand beyond photography, into other mediums such as installation and sculpture. Studied undergraduate fine art at Sir George William’s University (Concordia) in Montreal, PQ and fine art photography at The Maine Photographic Workshops in Rockport Maine, USA. Since 1983 she has participated in over 30 solo and group exhibitions, including: 2007 Order Inside Chaos, Station Gallery, Whitby ON, 2004 Markings Gallery Vertigo, Vernon, B.C., 2000 Memory and Nature: The Iris Group at the Millennium The Art Gallery of Northumberland, Cobourg, ON, 1998 Gros Morne by Foot, Sherman Hines Museum, Liverpool, N.S., 1994, 1991, 1990 Sacred Silences: Stone Circles and Megaliths The Station Gallery, Whitby ON, The Latcham Gallery, Stouffville, ON and The Rail’s End Gallery, Haliburton ON, 1993 Urban Photographics Urban Photographics Projects, traveling to several Canadian public galleries. , 1992 The Experience of Place: A Silent Language The Robert McLaughlin Gallery Oshawa ON, 1986 New Photographics Gallery 44 Toronto ON. Mary Ellen has received several awards of excellence, including: 2012 Professional Women Photographers (USA) 36th International Exhibition, 2 honourable mentions selected by juror Mary Ellen Mark; 1993 Urban Photographics (Faces of Canada) 2 selections for the archives of the Museum of Civilization and 1986 National Association of Photographic Artists (Canada), 2 Judges Choice awards. Rodgers is an artist, writer, curator and educator in Oshawa, Ontario. She writes essays, articles and reviews for several art publications and is the author of Locating Alexandra (Toronto: ECW, 1995). She is the founder of the IRIS Group. Recent exhibition activity includes In Tune, BluSeed Studios (Saranac Lake NY) Money etc, RED, IRIS at BOLA (Oshawa) liminal spaces: new century of the city, Hamilton Artists Inc, New York Story, Clarington, IRIS in the Adirondacks (Saranac Lake, NY) Fluid 2 Agnes Jamieson Gallery (Minden) Deviant Detours, Kunsthaus Gallery (San Miguel de Allende, Mexico) EDGE at Red Head Gallery (Toronto.) She is a former Director/Curator of the Visual Arts Centre of Clarington. An honor graduate of Georgian College and The Ontario College of Art and Design, Toronto, with a year’s study in Florence, Italy. Janice has been trained as a printmaker and painter with a focus on portraits in oils. Her recent work continues to create portraits in other media. Included below is “A History of Small Gatherings”, which displays hand prints collected from the International Women’s Day Celebrations. She is also an apprentice-electrician. Recent exhibits include Iris in the Adirondacks at BluSeed Studios, Saranac Lake, New York, and Artsweek Peterborough 2010. 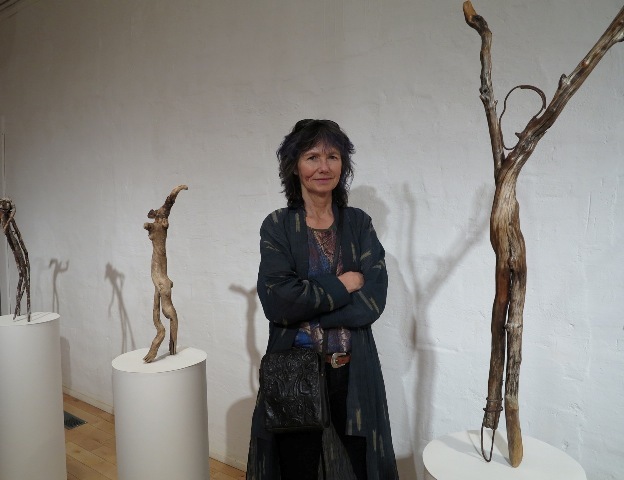 Sally Thurlow is a multi-disciplinary artist. She recently had a solo show at the Visual Arts Centre in Bowmanville, ON which will be traveling. This latest series of sculptures was brought into focus by a six week Artist in Residency program by the sea, in Newfoundland’s Gros Morne National Park. Her solo show, Canoe Dreamings finished a two year tour of six Ontario public galleries in 2008. Following the Canoe Dreamings series, this work is closely related in terms of cultural and environmental explorations. The work employs 3 separate, yet interconnected elements: driftwood figures, porcelain shards, and rock-shaped vessels as a repository for memory and reflection, all found where land meets water, offering us new meaning, while appreciating their origins and history. “Shorelines border one world with another, where the beachcomber’s harvest is exposed by nature’s rhythm in deep time. This flotsam and jetsam: what is it saying, washed up with twisted limbs, rusted protrusions, broken down compositions? Memory is embedded, ennobled by the process of ageing. From being tossed away or lost, then washed up, then recovered and restored to dignity and purpose, these forms represent a deeply human longing for reclamation. Like all of us, they are simply travellers through time, looking for meaning.” from RECLAMATION catalogue. Sally grew up in rural Toronto. She has lived by the water most of her life. This has greatly influenced her her work as well as her BA majoring in Fine Arts from the University of Toronto, finishing with Cultural and Environmental Studies at Trent University, with significant earlier studies at OCAD and George Brown College. She has given numerous talks and workshops at Trent U and in schools, public galleries, and for private groups. She has been the recipient of numerous Ontario Arts Council Awards, and is a member of The Iris Group and The Red Head Gallery, both artists’ collectives. Her work is held in private collections across Canada. For more information please visit her website: www.sallythurlow.com and You Tube: Sally Thurlow, for a four minute video. Wendy Wallace is a graduate of the University of Toronto and Sheridan College where she received a Bachelor of Arts with a Specialist in Visual Studies and Major in Art History (1984). She received a scholarship in 1985 from the Banff Centre's School of Fine Arts where she completed an independent study session. In 2009 Wallace continued her studies receiving a Bachelor of Education from the University of Ontario, Institute of Technology. The Robert McLaughlin Gallery in 1994 purchased A Cultural Symbol Of life in Durham Region, for their permanent collection. In 1997 her work was chosen for Art on Public Lands Competition, and the resulting work, Symbiosis, was exhibited at the Visual Arts Centre of Clarington, 1998-99. This work was installed on the exterior grounds of the Robert McLaughlin Gallery during her solo exhibition Evolving Artefacts, 1999 and remained there till 2005. 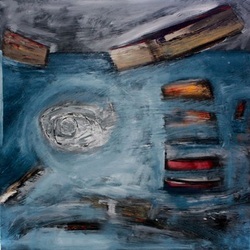 Wallace's work has been shown in numerous solo and group exhibitions including The Station Gallery, Whitby Arts Inc., Doris McCarthy Gallery, University of Toronto, Scarborough College, Durham Art Fest, Visual Arts Centre of Clarington, the Robert McLaughlin Gallery, Art Gallery of Northumberland, Kent Farndale Gallery, Latcham Gallery, Downtown Oshawa, Red Head Gallery, Toronto, Kunsthaus Gallery, Brooklyn Library, New York and recently at Hamilton Artists Inc.
Wallace has received individual artist grants from the Ontario Arts Council and project grants from the Canada Arts Council to create and further develop bodies of work. Since 1999 Wallace has received the Ontario Arts Council, Artist in Education Grant sharing her art practice with students across Ontario. Wendy Wallace's images reflect on subjects that play with the metaphorical narrative. Her work challenges environmental relationships of living creatures, plants, architecture and the manufactured object resulting in a residual imprint of activities. Wallace’s work creates narratives of these observations and challenges the interrelationships of architecture, industry, people and nature. The work embodies a social consciousness; images cruise through the consequences of roles subjects play in the landscape centered on the impact of the narrative.